Well good ol’ K-Rudd is the latest politician to jump on the gay marriage bandwagon and give it his stamp of approval. Pity he’s a few years too late to action it as PM, but I could not be happier! In a post on his blog, he wrote in detail about how his opinion about the issue had changed, and how he was even the last person in his family to come around to the idea of it. Personally, I don’t see why this is such a big issue because, well, it shouldn’t be one! To me it’s the equivalent of not letting black, aboriginal or people of other ethnicities have rights in the country they live in. We stopped that a long time ago, so why is gay marriage still not allowed?! Gay people are people, and if they love each other, they should be able to commit to each other in whatever way they wish. 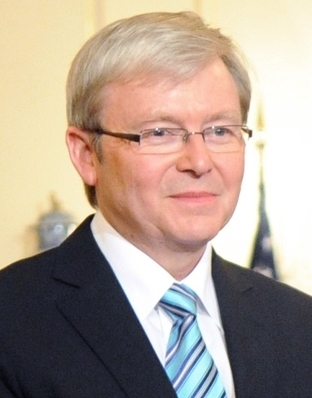 K-Rudd has urged Abbott to give the Coalition a conscience vote on the issue. I don’t know that Abbott or Gillard will listen, or even budge on their opinions. And I really don’t think that politicians take the public opinion on the matter into consideration. The generations that have a lot of control these days in the voting arena are young Australians who have grown up with openly gay friends, relatives and even parents. If one or the other really thought about it and listened to others I honestly think they would change their opinions about gay marriage, and it’s likely that the public would vote for them in a heartbeat. But, it seems to me, our leaders are living in the dark ages when it comes to equality. They’re making decisions based on religious views or dictionary definitions of what marriage should be. Well, let me tell you Gillard and Abbott, guess what? Not everybody is religious, and the definition of marriage is so archaic it needs to be updated itself. In his post, Rudd went into quite a lot of detail about how he wrestled with his stance on gay marriage for a while, and that he even spoke to a close friend, who recently came out as gay, about it. To me this shows that he didn’t just make the decision to please a whole lot of people, but he’s actually just evolved with the day and age that he’s living in and has come to the conclusion that if two people love each other, why shouldn’t they be able to get married? If I could high-five him I would. What do you think about K-Rudd’s new position on gay marriage? This entry was posted in News, Opinion, Politics and tagged gay marriage, in brief, marriage equality, News, politics. Bookmark the permalink.